President Brig. Rtd. Julius Maada Bio has officially commissioned the newly constructed Makali Community Health Centre on Saturday January 19, 2019 at the Konikay Barina Chiefdom, Makali in the Tonkolili district. The construction of the new Community Health Centre and the rehabilitation of staff quarters were funded by the Department for International Development (DFID) and managed by UNFPA. Commissioning the Health Centre, President Julius Maada Bio underscored the importance of a health centre, stating that his government have place premium on human capital development of which health is a big component. President Bio defined human capital development as when the health component was taking care of the wellbeing of the human being, feeding the brain with knowledge and skills to be useful in the 21st century, and also feeding so that hunger will be a thing of the past. He said they have it as a responsibility to take care of the health system and also make sure that there was food security, while providing quality education. He noted that when the three are together, then they can develop and enhance human beings, and at the same time the human capital will be completed, ready and fit for purpose in the 21st century. 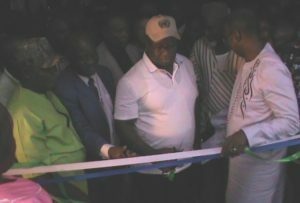 He disclosed that his government was working fervently to make sure that the health systems were improved and enhanced. He re-affirmed his commitment that this time around the government meant business and serious about their commitment with regards human capital in the country. DFID Deputy Head, Sandra Baldwin expressed delight to working in partnership with the government on one of the highest development priorities in the country in safeguarding the health of women and children. She disclosed that in Makali, DFID has been able to work closely with the Health Ministry and UNFPA to refurbish the Community Health Centre, so that it can provide high quality and emergency maternal, newborn and child services for 24 hours a day. Sandra Baldwin reiterated that DFID stands ready to continue supporting the training of staff, maintenance, and good procurement practice for essential equipment. She added that DFID will continue to compliment government’s efforts to safeguard pregnancy, birth and early years for children across Sierra Leone. Health and Sanitation Minister, Dr. Alpha Tejan Wurie said the British government has been supporting the people of Sierra Leone through a programme called “Saving Lives” and commended them for the support. He stated that according to the DFID Deputy Head, the British government has secured funds for the construction of six entities which, he said, will improve the health care delivery services in the country. Dr. Wurie disclosed that with those funds every chiefdom would have a community health centre that would serve its population. Giving an overview of the project, UNFPA Officer-In-Charge, Dr. Chris Oyeyipo, described the commissioning as a step in the right direction of getting quality health care services to the people of the country. He said the Makali Community Health Centre serves a population of 6, 920 people and provide 24 hours services on a daily basis. He added that the aim of the intervention in the facility was to elevate the quality of care to the required standard with a view of positioning it for the provision of quality Maternal, Newborn and Child Health (MNCH) services with a focus on Basic Emergency Obstetric and Newborn Care (BEmONC).